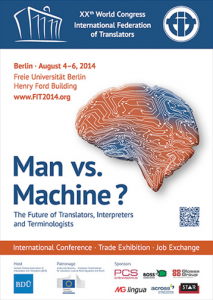 Red T will be joining the International Federation of Translators (FIT), the International Association of Conference Interpreters (AIIC) and the International Association of Professional Translators and Interpreters (IAPTI) in a panel discussion chaired by FIT’s Human Rights Committee. The panel is entitled “Protecting Translators and Interpreters in High-Risk Settings,” and the emphasis will be on the joint efforts of FIT, AIIC, IAPTI and Red T. Representatives of each organization will report on the activities undertaken to date as well as discuss future ones. Panelists will explore avenues on how to strengthen the collaboration, including broadening the involvement of national members. The open question section will focus primarily on the expansion of protective actions geared at safeguarding linguists across the world.